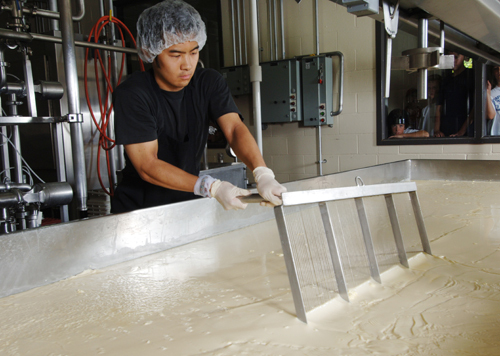 Ever wonder how cheese goes from creamy, white milk to our delicious, hand-made cheese? 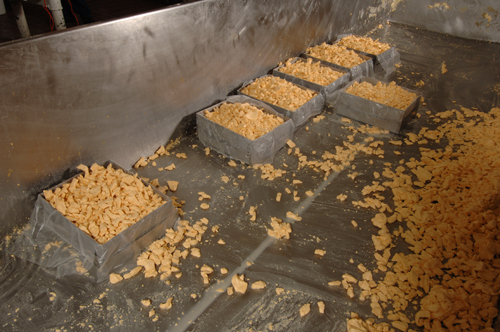 Follow the slideshow to the right, provided courtesy of Dairy Plant manager Jonathan Hnosko. Tours are given Monday-Friday, subject to availability. Be sure to check our FAQ page for detailed instructions. 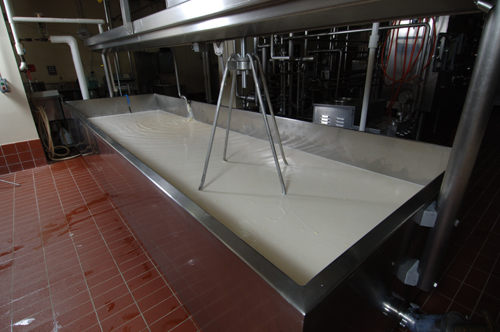 At around 5 a.m. on cheesemaking days, milk is pasteurized and poured into the cheese vat. This process takes about 2 1/2 hours. 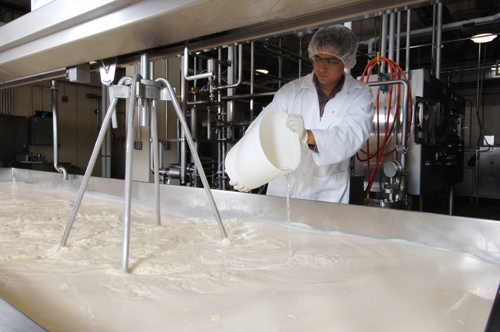 Culture bacteria is added to develop flavor and prepare the milk for an enzyme called rennet. 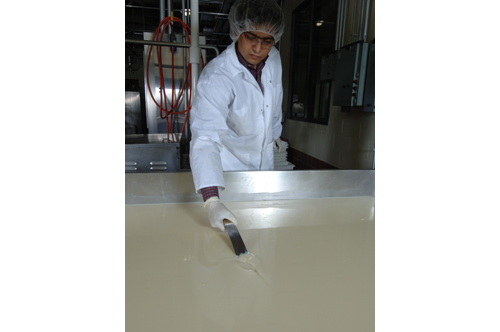 Rennet is added to coagulate the milk, turning its consistency to a gel form. Students check the set to ensure it is just the right firmness for cutting. 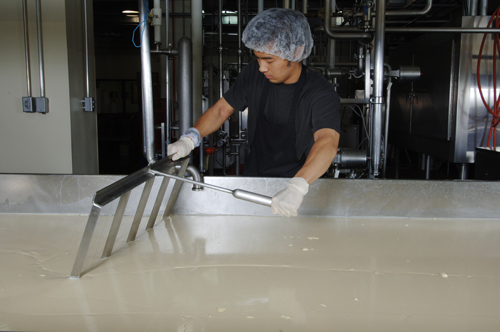 A Dairy Store student worker cuts down the long side of the vat with three different knives. 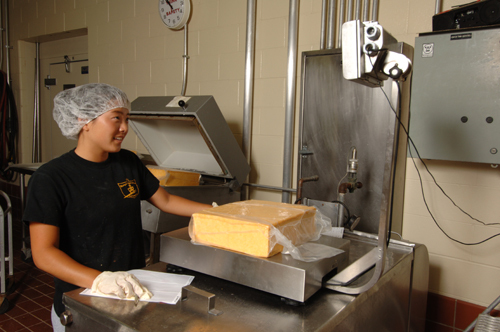 The cutting process is performed entirely by hand thanks to the help of Dairy Store student workers. Cross-cutting forms the curd that will become cheese. 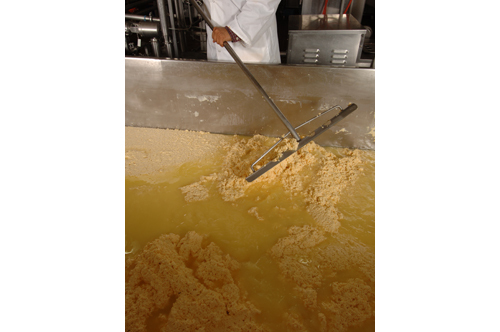 After a brief rest period, the curd and whey mixture are stirred and cooked for about 45 minutes to further firm up the curd. 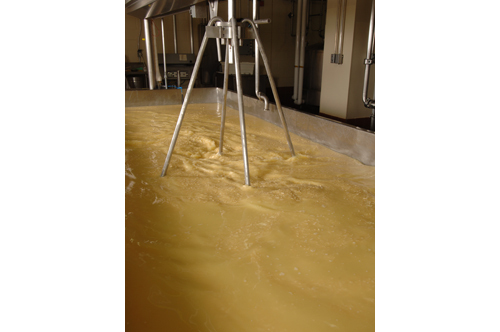 The liquid is drained from the vat to separate the whey from the cheese curd. 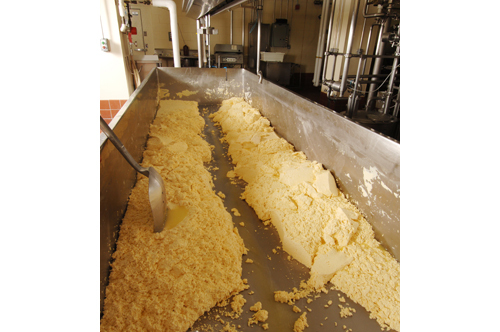 Individual curds are allowed to mat together into piles before they are scooped to either side of the vat. 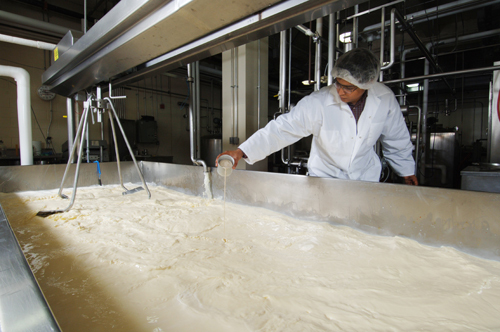 The piles are cut into large loaves and the acidity of the curd is monitored. The loaves are cut again when the acidity is just right to prepare them for the milling process. 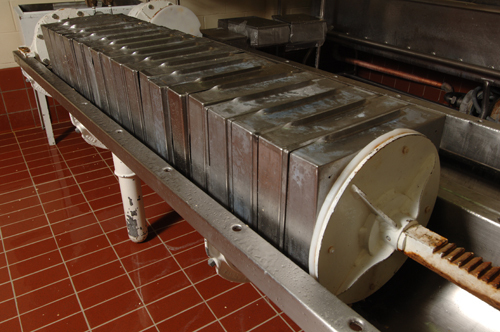 The milling process grinds the loaves back into smaller pieces. 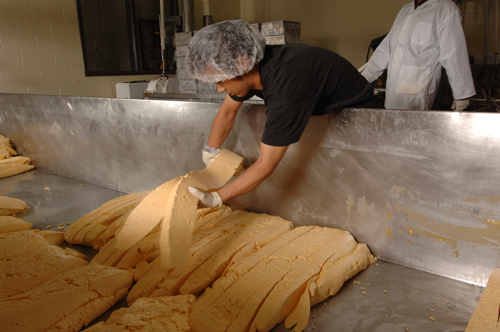 The milled curd is ready to be salted. 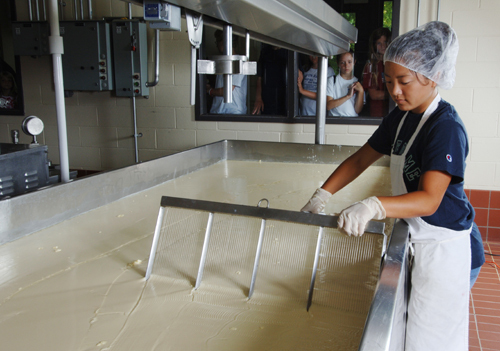 Student workers weigh out salt by hand and mix the curd while salting it in intervals. 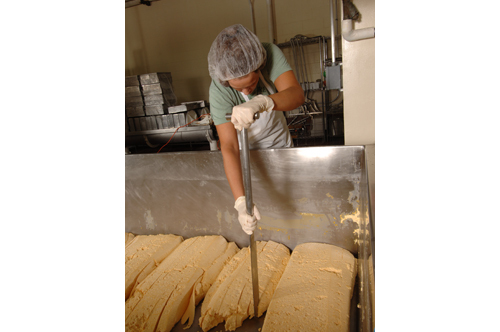 The curd is scooped into boxes lined with cheesecloth. Each box must be weighed just right. 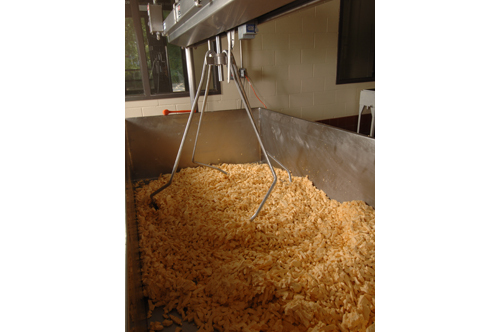 One batch will yield about 800 pounds of cheese. 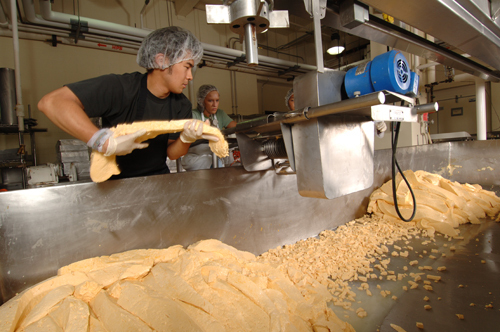 The boxes are pressed overnight on a machine that is hand-tightened. 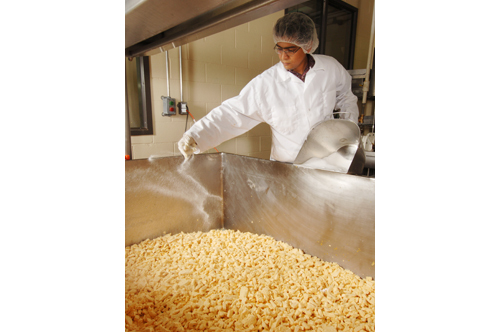 From adding the milk to this step takes eight to nine hours depending on the cheese style. 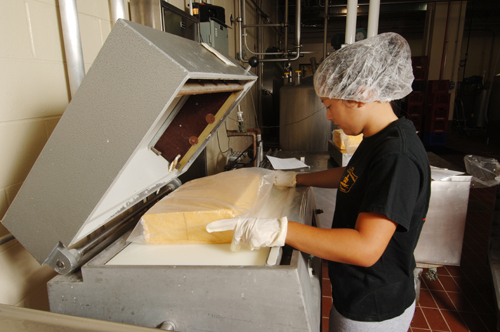 The next morning, student workers unpack the cheese blocks and seal them in plastic bags. 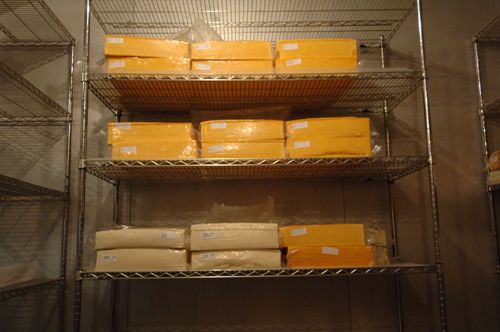 The cheese blocks are weighed and tagged with their dates and style. 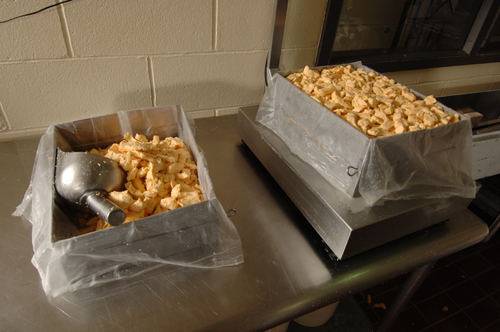 The blocks then travel to the cheese cooler, where they will be aged to perfection. 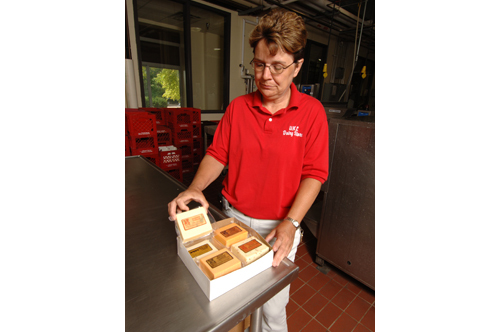 Kathy shows off one of our prized cheeseboxes. Mon-Sun: 11 a.m. - 9 p.m.